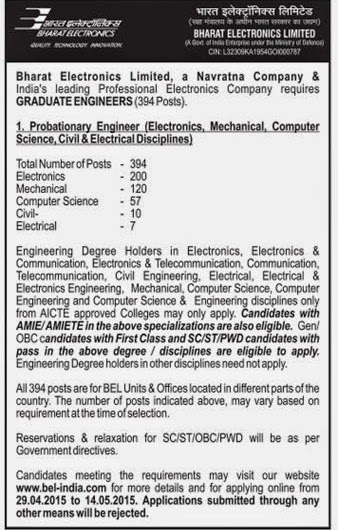 Bharat Electronics Limited (BEL) has given a employment notification for the recruitment of Probationary Engineer Posts. Interested candidates may apply online application through Official Website www.bel-india.com on or before 14-05-2015. Other details on BEL Probationary Engineer Recruitment 2015 regarding age limit, education qualification, selection process will be mentioned below.